When it comes to enormous mammals, it's difficult to imagine anything bigger than hippopotamuses and rhinoceros. Although both animals come in multiple species, white rhinoceroses are the biggest of all rhinos, and common hippopotamuses are the bigger of the two existing hippo varieties. White rhinoceroses, however, are larger than common hippopotamuses, according to the Wildlife Conservation Society. 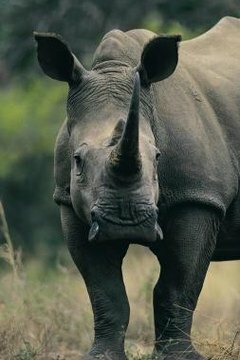 The white rhinoceros (Ceratotherium simum) is the heaviest and biggest in the rhino world, according to the San Diego Zoo Safari Park, beating out Sumatran, Javan, Indian and black rhinos. These rhinos, which are actually grayish in color, usually weigh somewhere between 3,171 and 7,929 pounds, indicates the University of Michigan's Animal Diversity Web. The common hippopotamus (Hippopotamus amphibius) is the largest of the extant hippo world, although the species only has the pygmy hippo as competition. These rather gregarious and companionable herbivores are usually in the range of 2,600 pounds, reports the Philadelphia Zoo. In very extreme cases, however, some of them can be as hefty as 5,500 pounds -- massive, but still nothing on the biggest white rhinos. The Sumatran rhinoceros (Dicerorhinus sumatrensis) of Indonesia and Malaysia is the most diminutive of all of the rhino species, according to National Geographic. These solitary animals, while still very heavy, usually only weigh around 1,760 pounds. If you compare a Sumatran rhinoceros to a common hippopotamus, the hippo will almost certainly be significantly larger. The answer to the size comparison between both animals always depends on the specific species and specimens. If you compare a pygmy hippo to a white rhinoceros, the difference in weight is also astounding. Pygmy hippos usually only tip the scales between 350 and 600 pounds, indicates the San Diego Zoo. Although they share visual similarities with their common hippo counterparts, the size differences are immense. Although rhinoceroses and hippopotamuses are both definitely mind-bogglingly big creatures, African elephants (Loxodonta africana) leave them both in the dust, size-wise, according to the African Wildlife Foundation. They can weigh well over 13,000 pounds -- no joke. How Many Pounds of Bamboo Can a Giant Panda Eat Each Day? When Do Lion Cubs Start Walking?